We have a remodel going on in Alum Rock. 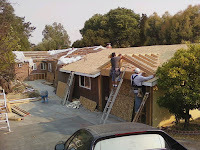 The demo was completed last week and some of the framing and roofing has begun. This remodel will include the garage, the living room, the bathroom, one of the bedrooms, and the laundry room. We will also be adding a porch with an overhang. 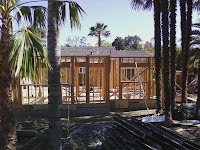 I've added the floor plans for this project and a couple pics of the framing that went on this week. On a side note, we have completed the San Jose remodel and will be adding a final post for that project early next week. Here are some updated pics of our Campbell project. 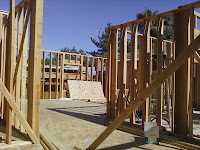 As you can see the framing of the walls for the master bedroom is well under way. 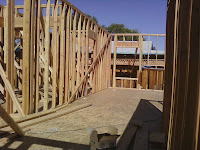 The complete framing normally takes 3 to 4 weeks depending on the size of the job. 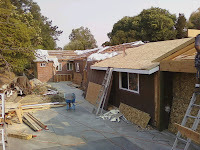 Once the framing is complete, the construction of the roof will begin. Here are the latest pics of the "goings on" at the Campbell project, and a slideshow of the progress made so far. With the underfloor and floor insulation inspections complete, the construction of the subfloor is underway. This should be complete in the next day or so and then the framing of the bedroom will begin. We have begun construction on the flooring of the master bedroom addition in Campbell. The framing has been completed and the under floor plumbing is currently being installed. This will be followed by the subflooring after the underfloor inspection is completed later this week.